With a UK wide expansion planned for its High Street stores and Express outlets in large shopping malls, Pizza Hut Delivery – part of the Yum! family of brands including Taco Bell and KFC – approached WDAD to design and build a responsive recruitment website that would convey a real sense of what it’s like to work for them and convey their employer brand. A new brand – Life Unboxed – had just been launched and we needed a website that would quickly and effectively get over the three central pillars of that brand; Become Your Best, Make Friends and Have Fun. We also needed to really engage with Bike Riders and Car Owner Drivers in particular; a target group which they required in large numbers and who had traditionally been hard to recruit. In addition, the ATS was changing and we needed to do a soft launch of the new Search & Apply functionally in Yorkshire in tandem with the old site and ATS, followed by a nationwide launch. We designed and developed a bespoke WordPress site with a concept based upon pizza slice shapes to create a navigational spinning pizza wheel and an angular web page design to separate content. Finding a suitable solution for both elements was a challenge, but it really sets the website apart and gives it a unique look. There’s a fantastic video on their culture and a more traditional talking heads one for Drivers to engage with the target audience. 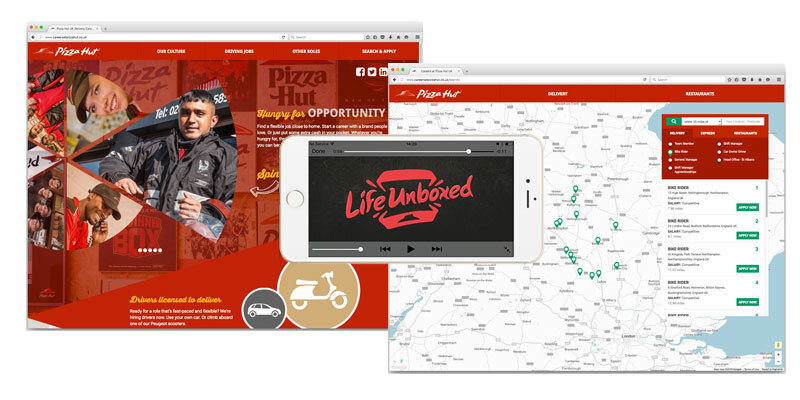 www.careersatpizzahut.co.uk launched in September 2016 and has been very well received. The next phases of development are already being planned with staff profiles, social integration and a new page being produced which focuses on their extensive training and recognition schemes. All should be live by Q1 2017.